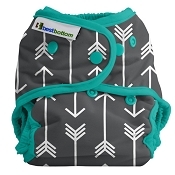 I originally picked these up with disposable inserts for a few days traveling, but find I liked it just as much with my Bummis infant prefolds we have. They fit perfectly in fully unsnapped shell on my toddler, and are great to put on quickly like in the back of a car seat on wiggly toddler… My son sat on the scratchy side of some velcro wearing only the diaper, that made the outside of the shell a bit pilly in one spot, so I would definitely be more careful in the future. I like how trim they are (depending on insert of course). The elastics are very gentle too. The velcro worked very well for us. I hand washed them quickly and rolled in a towel to dry faster before hanging it up, worked perfectly to use again a few hours later! I will definitely hold onto these and maybe add one or two. I can't wait to try them on newborn or small baby, I think the velcro will make it possible to have a great fit! I am disappointed that there is a hard snap at the back to secure the insert to the cover. For a newborn spending so much time on her back, I don't think it is a good choice. Which is too bad because the inserts are available in organic cotton and are also contoured instead of folded up squares of fabric so they would be more trim. I look forward to using these for my baby when she is not spending so much time on her back and more time sitting or on her tummy. Use the laundry tabs, don't get lazy!! The velcro is great until you get lazy and don't prep it properly for washing. 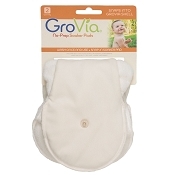 Love my Grovias though, great diapers. Hook and loop fit my son much better than the snaps. The mesh inside absorbs pee, so I can't reuse the covers as much as I would like because they stink after more than one use if he wasn't changed immediately after a pee. I like the customized fit h+l affords,however longevity wise, they are not worth it. My older h+l is dead and cannot be revived sadly, rendering a perfectly good diaper useless since there's no way to refresh it. 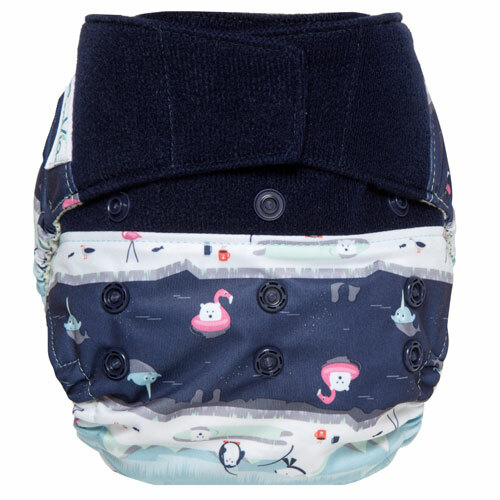 I have tried several different brands of cloth diapers and these are by far my favourite. I prefer the fleece snap-in liners to the cotton, although they’re both good. 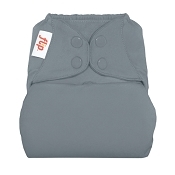 I like that the liners snap in, rather than having to “stuff” the diaper. Fit is great and so is absorbancy. Would def recommend these. The Grovia hybrid system is fantastic. We have several of the hook & loop covers. 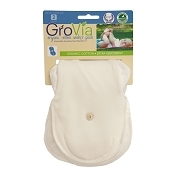 My husband loves them because they're very user-friendly and easy to get on the baby. I'd pick snaps next time if it were up to me. After 6 months, the hook & loop closure is starting to show its wear. One of the covers the side is barely sticking at all anymore. My mum gave me this diaper when I told her that I might try cloth diapers when my baby was born. She got it second hand (like new). I liked it so much that I ordered more. I really like the mesh fabric on the inside and that it's quite fit. 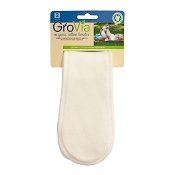 Q: does the hook and loop grovia shell come with soaker pads? or purchase seperatly? A: Soakers are purchased separately.